And why it's such a HUGE DEAL in downtown Hannibal. Steampunk can be a vague notion to pin down. Some will tell you it has something to do with gears.. lots of gears.. Some will tell your to watch movies like, Sherlock Holmes, Wild Wild West, or The Greatest Showman. How do the Wild West, London, and a Circus all mix together to make Steampunk?With so much crossover it's easy to get a little lost in the Steampunk vision. Steampunk is a genre of science fiction that combines historical elements with technology and aesthetics elements inspired by 19th century steam-powered machinery. What does this all have to do with the land of Twain? 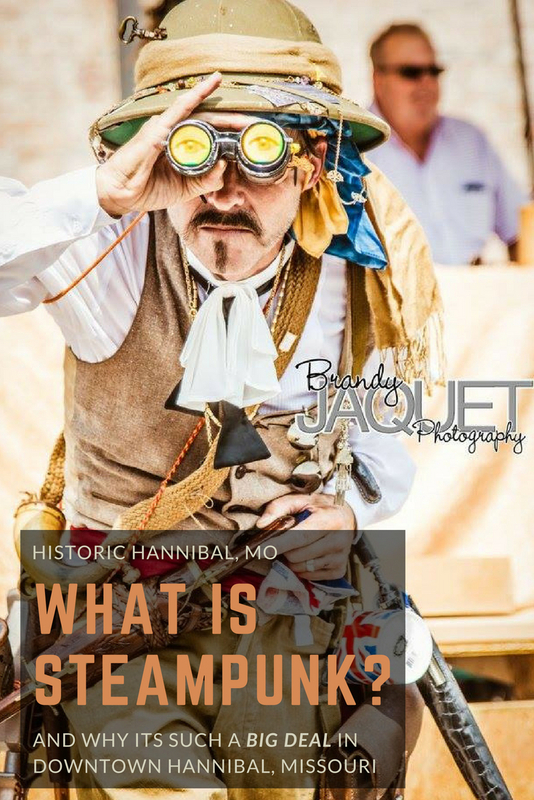 The Hannibal History Museum founded the Big River Steampunk Festival five years ago to be held each year on Labor Day Weekend. Each year the festival attracts thousands of guests to immerse themselves in the Steampunk persona. What can you expect from Big River Steampunk Festival? The Big River Steampunk Festival is unusual compared to other Steampunk festivals and conventions. Most Steampunk Festivals take place in convention centers in major metro areas. Big River Steampunk draws from the historic ambience of downtown Hannibal turning the whole downtown an immersive Steampunk cosplay environment. Prepare yourself for a thrilling and unique Steampunk experience! This Festival is one of the newest festivals to downtown Hannibal, just in its 5th year in 2018, but it is now one of the most popular! Big River Steampunk Festival attracts almost 10,000 guests to historic downtown Hannibal many of whom will be decked out in full Steampunk Style & Fashion. One of the most entertaining parts of the festival is meeting and viewing the creativity of the participants. Many of the costumes at Big River Steampunk Festival are hand crafted by dedicated Steampunkers. Stroll pedestrian-only Main Street amongst authentic 1840s buildings and enjoy Steampunk costumery at its finest. Though costumes are not technically required, we strong recommend you try it! Each year a free costume contest is held for all participants and this year there will be not one, but three costume contests! And if you have an extra special beard or set of whiskers there is a free facial hair contest for you as well! Steampunk Merchants from all over the world will be set up in shady Kiwanis Park on the banks of the Mississippi selling Steampunk wares. The Great Midway Stage will be set up in the park hosting Make-N-Takes and creative Steampunk workshops. A sport that is equally enjoyable for children and adults alike, but Steampunk-ified! Turn those Nerf Guns into Steampunk machinery with all the gears, bells, and whistles and get ready for Nerf Dueling! Splendid Teapot Racing incorporates RC Teapot Racers complete Big River Steampunk Festival's custom obstacle course featuring the Tunnel of Terror, Ramp of Doom, and Chasm of Death. What could be more fun! The judges may or may not bribery to even your odds. The parade begins on Saturday of the festival and kicks off the celebration! View all the glory of Steampunk Fashion as amazing characters parade down Historic Main Street. If you are decked out in Steampunk Style feel free to join the parade! The Big River Steampunk Festival features free-to-the-public entertainment on the Main Street Stage! Comedians, jugglers, exciting escape artists, rowdy pirates, singers, musicians, dancers and more will thrill and delight audiences of all ages! Presentation of Costume Contests also take place on the Main Street Stage. Dock your Air Ship in Air Ship Village! Big River Steampunk Festival allows guests to book a free space in the Air Ship Village as a place to set up a Steampunk Style tent, pavillion, etc. as a place to regroup and relax during the festival! Sign up with your email address to receive news and updates on Historic Downtown Hannibal happenings.